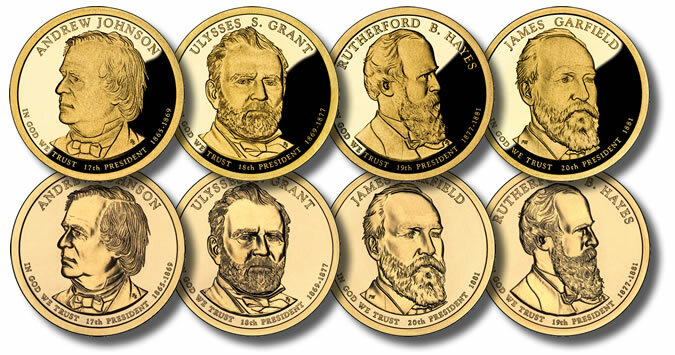 When issued, the 2011 Presidential Dollars will represent the fifth year for a series of coins struck to honor the former chief executives of the United States. 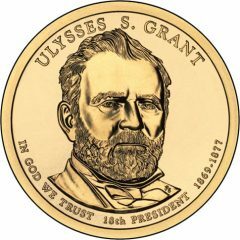 The United States Mint this week released coin images of the $1’s. Up until now only line art designs had been available. The US Mint has also published the release dates for when it will offer them in bags and rolls. Historically, dollar bag and roll release dates also typically coincide with when the coins are distributed into general circulation via Federal Reserve Banks. 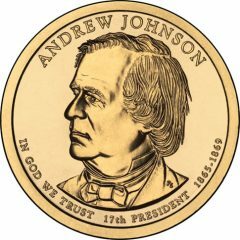 These coins feature an image of President Johnson that was designed and sculpted by Don Everhart. Andrew Johnson took the oath of office as President of the United States following the assassination of Abraham Lincoln. He had only been Vice President a short time after having joined Lincoln as his running mate for his second term. Johnson was brought on the ticket as a way of gaining support for Lincoln’s Presidency and his American Civil War policies because Johnson was previously a Senator from the southern state of Tennessee. Johnson was then left with the responsibility of the initial reconstruction efforts of the South following the aftermath of the Civil War. His policies proved to be very unpopular with his Republican base and he did not win a re-nomination bid for a second term. The coins honor the eighteenth President of the United States and feature an image of Grant which was also designed and sculpted by Don Everhart. Grant was a relatively unknown and unsuccessful individual when he rose to great prominence during the American Civil War. His leadership style and ability to accomplish tasks led to his appointment as Lieutenant General and command of the US Army by President Abraham Lincoln. His continual defeat of Southern forces led to their surrender to him at Appomattox where he gave the defeated Southern Army gracious terms. Hugely popular with the citizens who were reminded of his war record, Grant won the Presidency and assumed office in 1869. He served as President for two terms but also helmed the country during some tough economic times and several scandals linked to the White House. Coins honoring the nineteenth President of the United States feature an obverse image of Hayes by Don Everhart. Like Grant before him, Hayes rose to popularity owing to his war record from the American Civil War. Wounded on five separate occasions during that war, his bravery and leadership led to his eventual rank of Major General. He used this fame to become the nineteenth President in 1877. In office, Hayes ordered the United States Military out of the Southern capital cities and an end to the Reconstruction of the South still in progress following the Civil War. Making strides in civil service reforms, Hayes left office after only one term keeping a promise he made during his election. 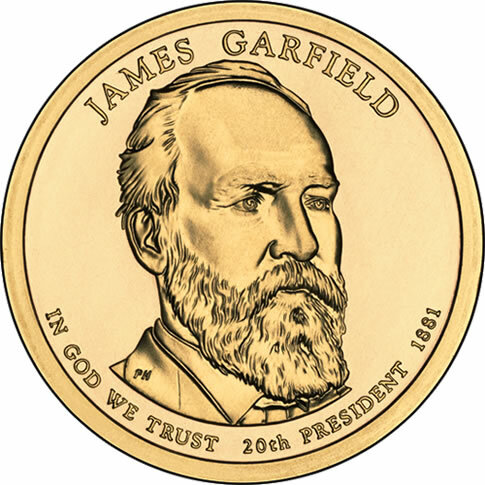 United States Mint Sculptor / Engraver Phebe Hemphill completed the image of Garfield that is found on the obverse of these coins. 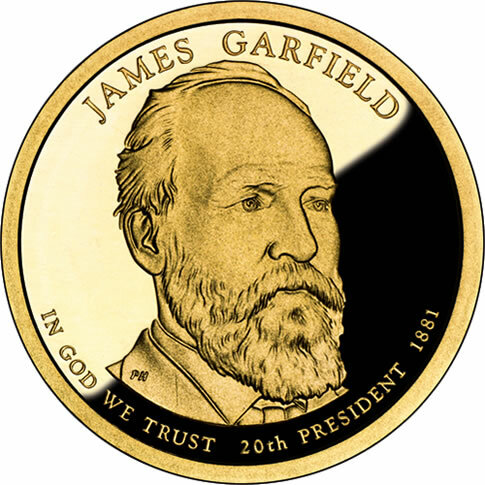 Garfield also served as an officer during the American Civil War and while serving was elected to the United States House of Representatives from the state of Ohio. He remained a congressman until his election as President of the United States in 1881. Unfortunately, Garfield was able to accomplish very little as President before being shot by Charles Guiteau on July 2, 1881. He survived a few more days, but passed away after having only been President for 200 days. This US Mint series of coins was authorized by the Presidential Coin Act of 2005 (Public Law 109-145) and debuted with four strikes in 2007. The first of these appropriately honored George Washington as he was the first President of the United States. Subsequent strikes in the program have been and will be issued in the order upon which the individual served as the nation’s elected leader. A total of four new coins are issued annually in the series which is scheduled to run until at least 2016. A stipulation in the authorizing Act dictates that no living persons be included under the program, and if a former President happens to pass away, that person shall only be honored after two years have passed since their death. As such, the last individual scheduled to be honored under the program is Gerald Ford who served as the nation’s 38th President from 1974-1977. 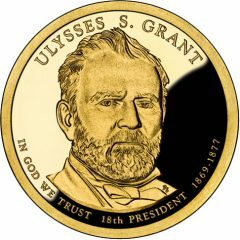 A portrait of the individual is shown on the obverse of each strike along with an inscription bearing their name, a number representative of the order in which they served, their years in office and IN GOD WE TRUST. The reverse of all of the coins in the series contains United States Mint Sculptor / Engraver Don Everhart’s depiction of the Statue of Liberty along with UNITED STATES OF AMERICA and $1. Making the coins more unique is the fact that an edge inscription is used on each piece. This inscription currently includes the year of minting, E PLURIBUS UNUM and the mintmark. The original two years of the series also saw the motto of IN GOD WE TRUST placed on the edge. Each coin is struck from a composition of copper with a manganese brass cladding that gives it a golden hue. 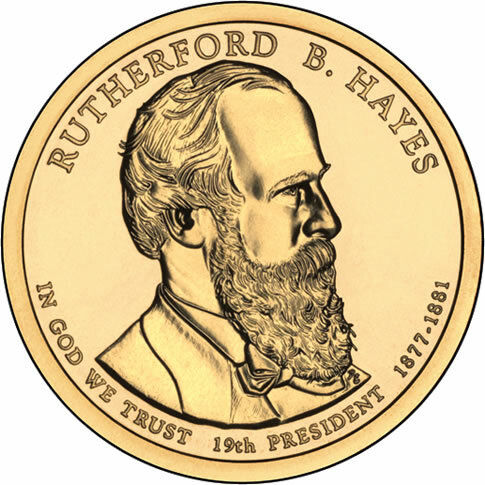 The four coins shown above represent the seventeenth through the twentieth in the Presidential Coin series. Those released before include the 2007 George Washington, John Adams, Thomas Jefferson and James Madison coins. In 2008, the US Mint released the James Monroe, John Quincy Adams, Andrew Jackson and Martin Van Buren coins. In 2009, coins were issued honoring William Henry Harrison, John Tyler, James K. Polk and Zachary Taylor. Finally, last year’s 2009 coins were struck to honor Millard Fillmore, Franklin Pierce, James Buchanan and Abraham Lincoln. 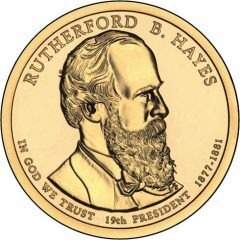 For a complete listing of Presidents by the years they will be honored, see the United States Mint release schedule. The coins are issued for general circulation, but may also be found in several special numismatic products from the US Mint including Proof and Uncirculated Mint Sets. Wait, why wouldn’t President Reagan be featured on one of these coins? He’ll be dead over two years before his coin would come up. President Carter may not get featured but somehow I can’t see this law being amended to feature all the Presidents even if they’re still alive. For all we know, this Presidential Dollar program might result in a permanent program featuring each new President as he is elected. Sigh…I was never happy with the Sacagawea design, but why couldn’t Congress just leave it alone and let the coin fail or succeed on its own? 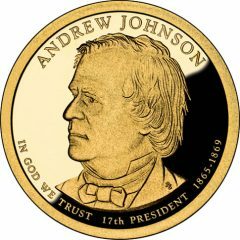 I don’t think the idea of featuring a current President on a standard circulating coin would go very far. It would change over 200 years of precedent that US coins don’t carry the portraits of any living person, much less the President. That dates back to Washington who rejected the idea as being monarchial. It could also become politicized even if the current toxic climate abates by 2017. I also agree about Congressional meddling with the Sacajawea design. It was balanced with the date and mottoes on the obverse/reverse. Moving them to the edge leaves a big empty space on the obverse in particular. However “letting it succeed or fail on its own” is impossible so long as the Treasury keeps caving in to Crane Paper’s lobbyists. Just you wait, eventually they will have President Obama on that coin. Man, that would be so funny!!!! @Munze : While I still think it silly to have the date incused on the edge, I’ll accept it as unavoidable for what I’m about to say and that is, why didn’t they move the motto “In God We Trust” to where the date used to be in order to make it more balanced-looking?